"Rotarian Frank D. Waterman, a member of the New York Rotary Club, contributed a very useful souvenir to those present, this being a combination envelope opener, cigar cutter and fingernail cleaner." At first glance, I wasn't entirely certain about this reference. The cigar cutter's blade doesn't seem a very effective letter opener, nor much of a manicure tool. Fortunately, there is one surviving example that retains its original box. 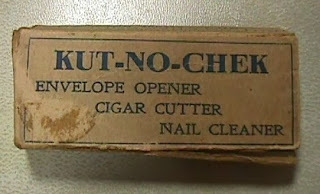 And there is its official description: "Envelope opener, cigar cutter, nail cleaner" -- along with the personal imprint of Frank D. Waterman himself. The Seattle Rotary meeting report allows us to place the Waterman cigar cutter, but likely as not the cutters were also given out at other times and at other events. Frank D. Waterman was an active Rotarian who traveled extensively; although Waterman cigar cutters are now rare, this may be a reflection of a low survival rate for an item that was both fragile and utilitarian. On the other hand, the slogan found on all known examples, "The Handiest Thing in the World", was not widely used in Waterman advertising, appearing in only a few ads and only in 1915. 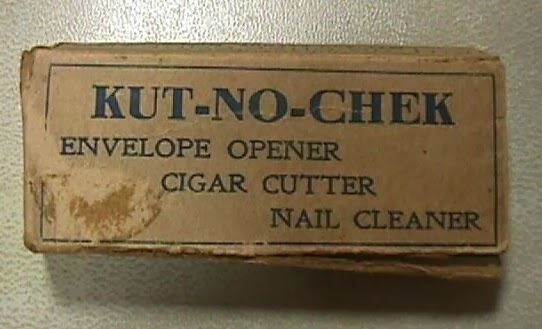 Kut-No-Chek, the manufacturer, made similar promotional cutters for other clients. The company is listed at 1 Madison Avenue in New York City in Polk's New York Copartnership and Corporation Directory for 1915. This is pretty cool! It's almost like a pocket knife, but with a couple of different tools, like a cigar cutter. Was it made in 1915, or is the piece older than that?